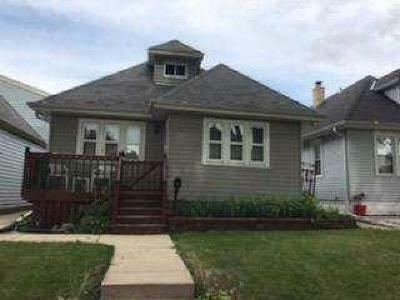 Bungalow with lots of original wood work trim and character. Original hardwood floors are in great shape. Decorative original fireplace and dining room built in characters add to the charm. Upstairs is finish loft space with large bedroom and lots of storage. Large garage with lots of lighting and electrical outlets. Low maintenance back yard great for dogs or entertaining with large deck. Short Sale is not approved at list price. Please allow time for lender to approve an offer. Sold in AS-IS Condition. Seller & lender will not make any repairs or cure any defects. All Offers must include a Buyers Premium of $10000. This is in addition to the Offer price.